Are you self employed working out of a home office or thinking of trying telecommuting? Here are some potential pitfalls and ways to avoid them. Working from home is a great benefit for those of us who have that luxury, either by being self-employed or working for telecommute-friendly employers. The number of people working at home has steadily grown over the past few years. And it’s a trend that will only continue. 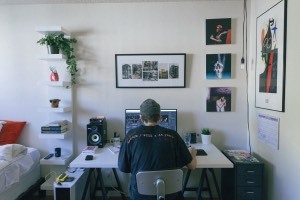 According to globalworkplaceanalytics.com, telecommuting is available to at least 50% of the US Workforce, and up to 90% of workers would like to telecommute at least part-time. On the flip side, there are challenges that most of us face when working out of the home office. Combining your workspace with our living space can present unique challenges, especially if you are married and even more you have children. 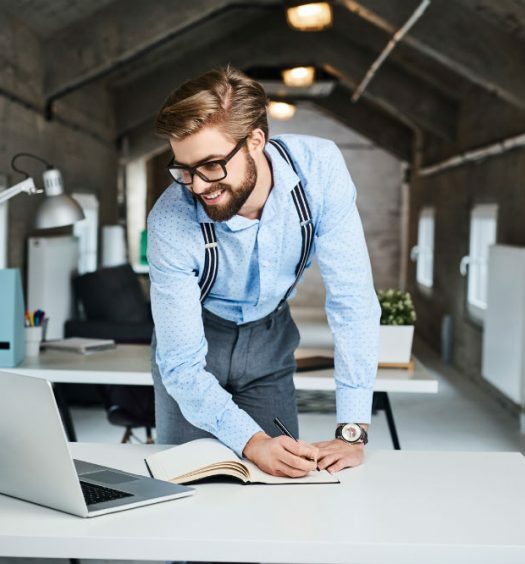 After getting a taste of working from a home office, many cannot imagine going back to an office, especially if you factor in commuting time. Being close to family can be one of the main advantages of working-at-home. It can be one of the most significant disadvantages too. Especially if you have an active household. Getting work done in the midst of a busy daily home routine can be a challenge. If you have children, the situation can become even more challenging, since it is hard to draw a clear boundary. Another challenge, especially if you spend significant time on the phone is managing the background noise and distractions that can happen. Setting clear boundaries, and getting buy-in from your family is essential for successfully working from home. You should treat your home business the same as you would if you were working in an office or a retail store. One way to achieve this is to set clear hours and the expectation that work time if for work, not household chores. Focus on work during this time and do your household chores when you would if you were not working at home. If that won’t work for you due to any obligations you have as a parent, then schedule your work time around them. Take advantage of any downtime like naps, school hours, bedtime. Don’t overestimate your ability to multitask. There’s plenty of research to show that true multitasking is a myth. In the end, we have to find a way to separate work from family if both are going to work. While it is true, we can work from anywhere when we telecommute, the goal should be to have a designated space or location. It’s much easier to enforce clear boundaries when we have a dedicated space where we can spread our work out, and keep our office equipment. The ideal case is to have a separate room or even structure to set up the office in. That is not always possible. How do we solve the space problem? You may have to be creative. Work where you can if you want to work at home. You may have to set aside a corner of the living room or share a guest bedroom. You can even get creative by decorating the walls to define your office space. At a minimum, set up your space with a nice desk and comfortable chair so you have a personal workstation. Establish some rules, even if you have to get out the duct tape and make yourself some walls. This is a special challenge for those who need to meet with clients directly. It will always be a problem of being taken seriously by some of those who work in a “normal” business setting. The goal is to project a professional, serious business image wherever you can. Maybe that means having an answering service with a live person to handle calls, our using a shared office space for business meetings. If you have enough space, having a separate office area with its own entrance is also a solution. Even the best-laid plans can be derailed for many reasons. We make that short commute to our home office to start our day to only be interrupted by the friend that drops by to chat. The temptation to take care of housework or home repairs take our attention away. The neighbor’s dog has been barking non-stop. The best way to deal with these challenges is to set rules for ourselves. While we are in the office, we have to stay focused on the task at hand. We have to work. If we can’t, we need to revisit number 1 above and adjust the boundaries or our work schedule. For some, there are times when it is impossible to work from home. A change of scenery can be a great help in these cases. I like to visit my favorite coffee shop or the public library. With laptop in hand and access to WiFi, I leave the home office for the “third office” where I can focus on the task at hand. This item refers to maintaining the confidentiality of documents, clients or projects you may be working on. You may have documents on your desk or notes on a bulletin board which may be private. Be aware of this, especially if you have visitors. Make sure you can protect the privacy of the work you do. For example, you can lock up confidential materials in a file cabinet, and shred the documents when they are no longer needed. This item may be related to item 1, depending on how you look at it. Making sure our families understand what it takes to operate a home business is essential. You should already understand this yourself, having made the decision to work from your home. Discussing the issue with spouses and children up front and asking for their support up front is important. After all, the work you do contributes to supporting the family. At the same time, we have to know where to draw the line and stop working for the business and start living as part of the family. With the home office so close by it can be hard to resist the temptation to put in a few extra hours for an important client or project. There is a line between work and family that sometimes do cross each other. Take the ‘setting boundaries’ advice to heart and set them with yourself as well. Remind yourself of the regular hours we discussed above. Advances in technology can cause us to take work with us way too much. Personally, phones, laptops, and 24/7 connectivity have allowed me to stay on top of emails way to easily. Set personal limits for yourself and shut the phone and computers off at some point in the day. Not being part of the traditional office environment reduces the opportunities for human interaction. For some, this is not much of an issue. They don’t miss having other employees around or the conversations around the water cooler. Going to a coffee shop or coworking space is a good way to minimize the feelings of isolation. Or maybe set aside a block of time to go to the gym and take an exercise class. You can also network with other home office workers in your area and set up a weekly meetup. Get together and discuss common issues and goals. You can organize a weekly coffee meetup, for example. Not only will it help solve the isolation problem, it is a great way to discuss solutions to a client or customer’s problem you had not thought of. Sometimes talking through a problem with a group can be just what you need to get past a mental roadblock. Your work is your livelihood. It can be harder to stay on task in a home office when there is no one watching over you to remind you to get at it. Not having a formal routine can be a challenge for some as well. Some of the solutions we have already discussed can help. Alternate periods of focused work with short breaks. Use a task list to visualize the urgent and important tasks. Limit the distractions and manage your time and you will be successful. Here are some more productivity tips. Depending on the nature of your work, you may run into issues and restrictions from your town zoning ordinances or condo association. Check whether your location will prevent you from having a home-based business or office. This is usually more of an issue if you are seeing clients. This might be the one thing you can’t fix or solve and it may be the biggest problem you face. Before you even consider the work-at-home route, make sure you won’t run into this issue. If, because of the nature of your work, you are prevented from operating out of a home office there are two solutions. One is you could move, although that may not be very appealing. The second option is to investigate renting space in a coworking space, or shared office space. With the rise in popularity of mobile workers, there are many options out there now. 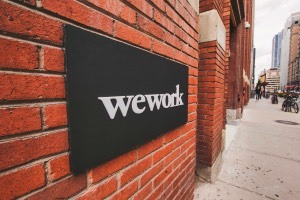 For example, Workbar and WeWork both offer flexible workspaces and meeting rooms which can be used for client meetings. Regus also meeting rooms, coworking space and virtual offices for mobile office workers. If you need location flexibility, the even offer membership options that allow you to use multiple physical locations. Using a shared office space can be a great option for the times when you need to see clients, or if you just need a change of scenery. Working from home can present many challenges, especially if you have a family. It is important to set the proper boundaries and communicate them to your family. Avoid the temptation to work too much merely because the office just steps away. And make sure you occasionally change things up by getting out of the house. A new environment might be just the thing you need to stay motivated.